If there was ever doubt about Apple’s product and marketing magic having the same impact cross the pond, let me assure you they are alive and well. 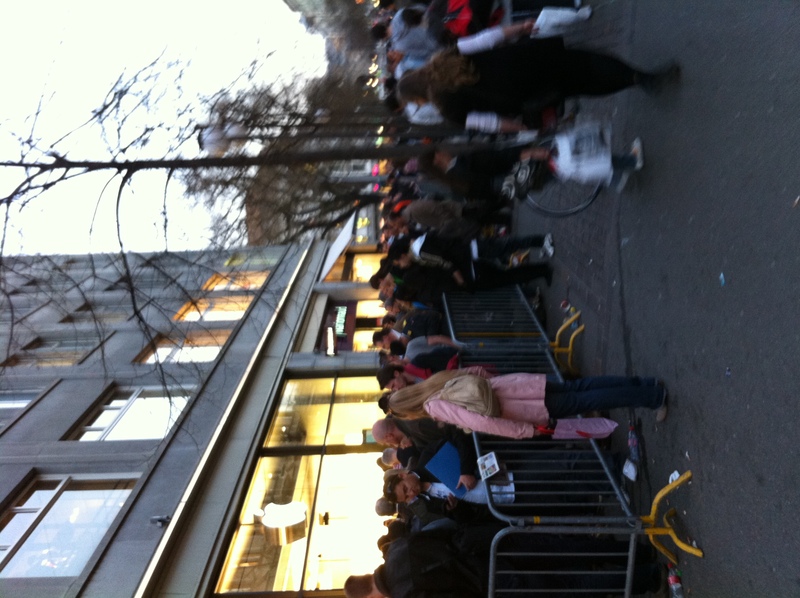 While I didn’t travel to Europe to get an iPad2, I did witness Day 1 of the iPad2 launch in Zurich. As it turns out I needed a power adapter and had to get one at the Apple store. I’ve attached a photo of the Disney-esque lines that wound over a block and a half along Bahnhofstrasse. I spoke to someone in line who traveled from Stuttgart to wait in line for the device. Amazing to see the Apple magic transcend cultures, languages and continents. Next week I will post some thoughts and news related to healthcare and technology specific to several European markets. Those posts will likely make their way to iMedExchange. In the meantime, I may drop a few posts from Baselworld….the largest watch and jewelry show in the world. It’s been several weeks since I have had time to post on my own blog because I have been busy reworking the iMedExchange site. The new site has a news orientation and content is directed toward physicians, hospital executives and industry. There is an enormous innovation gap in the healthcare industry. All one has to do is watch physicians engaged with any one of the top EMR products and you’l know why healthcare has a reputation for being at least 10 years behind other vertical markets. The technology is lousy. The user experiences are worse. Moreover, physicians without technology and business resources are at a significant disadvantage. As if there weren’t enough challenges, the quality of experts and writers in the space is indicative of the chasm that has yet to be crossed. When members of our team spend time with physicians there is almost always a question or conversation around business or technology. We decided we might as well take those conversations online in hopes they can serve a wider audience. You are welcome to check out our daily articles, tech tips and physician profiles at iMedExchange. What you’ll also notice over the coming weeks is the growing number of contributors. In the meantime, I’ll get back to posting here.